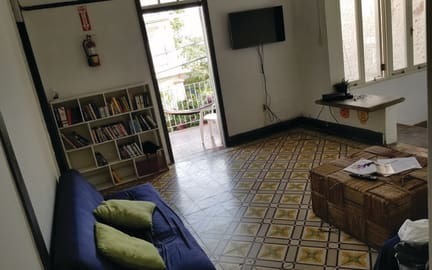 Hostel H1 Miramar v San Juan, Puerto Rico: Zarezervujte nyní! Cancellation must be received 48 hour&#39;s notification. In the event of shorter notification, the first three nights will be charged. H1 Miramar, a wonderful place to stay and enjoy our beautiful island! We are within close proximity to many of the city’s greatest attributes such as Condado beach, Condado Lagoon, La Placita de Santurce, Escambrón beach, Convention Center, and a five minute drive to the GREAT Old San Juan. Additionally, because of our location, we have the benefit of having delicious and affordable local Puerto Rican food within minutes of the hostel. For those who would like to use public transportation, there is a bus stop (T3, T5) just a 5 minute walk that can take you to Old San Juan, Isla Verde, Piñones, and Río Piedras. Our philosophy is simple: we want all of our guests to leave with great memories of Puerto Rico. That being said, we pride ourselves in offering the best customer service and providing a safe, fun, and friendly atmosphere for all of our guests. We regularly welcome guests from around the world, and enjoy catering to each guest’s unique cultural needs and languages. 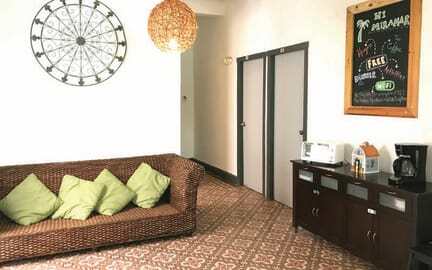 We offer guests a spacious and accommodating environment. Hostel H1 Miramar has 9 bedrooms, including both private rooms(restroom not in rooms) and dormitories. We have one full-sized fully equipped kitchen. Guests will be able to relax and converse with one another in any of our 5 common areas ranging from our terrace to rock garden.